Today, we are in conversation with Director of Shimla Hills, Ms Puja Yash Thakur ruminating on different aspects of her recent visit to Foodex Japan 2014. 1. Why did you decide to participate in Foodex this year? Our business has been growing; there is no doubt about it. But for 2014 we wanted to pursue new territories like USA, Japan and Africa. We already have our base in Madagascar, the doorway to African Agro Commodities. We have also been aggressively monitoring our business deals in USA. Japan, however, was something we had to start from scratch. Foodex Japan 2014 was perfectly timed for us and we wanted to make the most of it. Secondly, Japan is a benchmark with respect to food safety. Thirdly, and most importantly, Japan is a perfect gateway to enter into the neighbouring Asian Pacific countries of Korea, Taiwan, New Zealand and Australia. 2. Currently, are there any products exported to Japan from your company? 3. Generally, what is your understanding about the Japanese market? Foremost, I would put food safety. Not for once will the Japanese market compromise on the quality and value of food they import. They like their food absolutely faultless and fresh. Other aspect that I gathered about Japanese market was their inclination for IQF / Frozen foods, especially mango. Organic food products are also in high demand. Buyers were specifically interested in organic mango puree. One, this technology retains the natural flavour and freshness of food. This means there is no loss of nutrition, as there is no thawing involved. Hygiene is invariably maintained during the production of IQF product range. Two, irrespective of the season, the supply of food remains uninterrupted. Three, the convenience and ease of cooking involved with IQF is another factor that has made it such a success in Japan. 5. The product line you displayed at Foodex Japan. 6. Japan’s market response to Shimla Hills’ product offerings? Very good! In fact the Japanese buyers took keen interest in our products. Each buyer went in for a detailed meeting. This shows their penchant for product selection and quality. It will take some time for us to build our market presence here. But we have already started working on it and are completely committed to it. 7. Products that you are deeply committed to? Frozen fruits and vegetables to be very Japan specific. I would also like to add sesame and millets, seeing the market scope via the Korean market. 8. What kind of competition is faced by Shimla Hills at domestic and international levels? You see, businesses prosper when fierce competition exists. There is no doubt that Shimla Hills faces cut-throat competition, at the domestic as well as international levels for mango, which is our major product. But we have been able to draw our strengths, more clearly, from this competition. Price, quality & deliverance gives us an edge over others. One can argue these points to be too generic, but what I see is the level at which a company commits itself to them. You can never lower down quality in bid to offer competitive price. So what worked for us was capitalizing on the economies of scale by enhancing our plant capacity, sourcing from right place, minimizing waste management and bringing efficiency in our overall processing methodologies. The biggest and foremost aspect, we believe makes the difference is after sales support which we ensure is meticulously extended to all our clients. 9. What are the difficulties that you feel Indian companies face while entering into the Japanese food market? Meeting the strict quality and health norms of the Japanese market. 10. Did you visit other pavilions? Yes, I did. I really liked the South Korean, Taiwan and Jetro pavilions. Their pavilion layout and style were commendable, so were the product lines displayed by them. 11. What kind of food trends/innovation you observed at the event? Japanese are wine connoisseurs. This is what I perceived from exuberant booths displaying wine as the most sought after product. Next, was the innovation exhibited in the food packaging sector and the organic health oriented food products. 12. The most interesting and striking part of your travel to Japan. It’s got to be the hospitality experience here. It was indeed one of the best I have experienced so far. There is a very systematic approach to everything in Japan, be it inside or outside exhibition area. Bus transits were impeccably smooth. The preparations of the booth went without any hassle. TCS Co. Ltd. the company responsible for booth furnishing and preparation did an exceptionally great job. Everyone was very punctual and gave a prompt response. The most prominent part of this exhibition was colour coded entry passes. They helped in distinguishing the kind of visitors coming to your booth. Like red was coded for trader, green was coded for visitor and then there were different colours for VIP, e-shoppers etc. A lot of these tiny bits made this show and my travel in Japan an unforgettable experience. 13. Was language barrier a hindrance? No, not really. Most Japanese visitors I engaged in conversation with were quite fluent in English. 14. 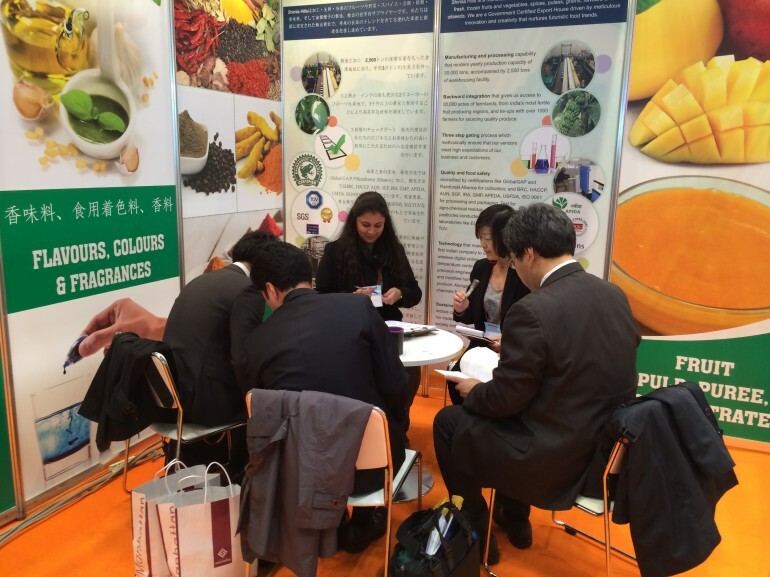 How do you evaluate Foodex 2014? Any plans for 2015 edition? It was altogether a learning experience. We were really able to identify the likes and dislikes of the Japanese market. What we aim for 2015 is targeting the sweet tooth of Japanese consumers. They relish taste, flavour and sweetness – we intend to target these for next year. We would also like to reorient our approach for Japanese market and make it more customer centric, now that we understand the nuances of market here. 15. JIIPA (Japan India Industry Promotion Association) – please share your experiences. Overall, it was a fantastic experience! But the marketing and promotional strategies of JIIPA need to be more strong. This will bring the Indian trade presence on a more prominent platform in Japan, which were kind of missing this time. Government assistance and efforts also need to be beefed up, if a lasting impression needs to be made on the Japanese market. 16. Please share your future plans, as a company entering into Japan. We’re positive on building a market for our products there; and also on establishing our footprints there. By Almighty’s grace, this will all happen soon!